In April, Snapdeal had unveiled 'Launchpad' offering a platform for innovators and inventors across the country. NEW DELHI: Online marketplace Snapdeal said it will showcase the first set of consumer-centric products, including a smartphone and a sports cam, created under its 'Launchpad' programme. 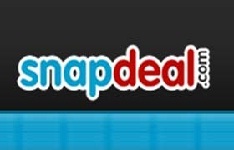 "Innovation and technology is the DNA of Snapdeal.com. The other existing sellers on the website are selling existing brands. We launched this platform to support creativity and innovation amongst new age entrepreneurs," Snapdeal Senior Vice President (Electronics & Home) Tony Navin said in a statement. The Click Pro (sports cam) and Alpha Feather (smartphone) are two products which Snapdeal is introducing with this edition of Launchpad as they address unanswered consumer needs, he added. Priced at Rs 12,999, the Alpha Feather claims to be the world's lightest 5-inch smartphone at 125 gms. Powered by the latest Android 4.4 Kitkat operating system, the device sports a 2 GB RAM, 1.3 GHz quad core processor, 13 MP rear camera, 8 MP front camera and internal memory of 4GB (expandable up to 32GB). "The team at Snapdeal has supported us seamlessly, they have helped us from the initial stages, reaching out to the consumers, marketing our product and distribution and logistics services. Also the partnership makes it easy for us to solely focus on innovation," Alpha Tech co-founder Kunjan Chauhan said. The 'Click Pro Oculus' Wifi Sports Cam helps one capture high-action videos and pictures seamlessly for activities like snowboarding, sky diving, para-gliding, bungee jumping and river rafting. With an image sensor of 12 MP CMOS Sensor, the device has a 1.5 inch LCD screen offering image resolution of 12MP, 10MP, 8MP, 5MP and 3MP. "Snapdeal has the largest user-base among all e-commerce companies in India, which will give us pan-India coverage. It gives us tremendous visibility at a minimal cost," Click Pro designer Sumit Kumar said.